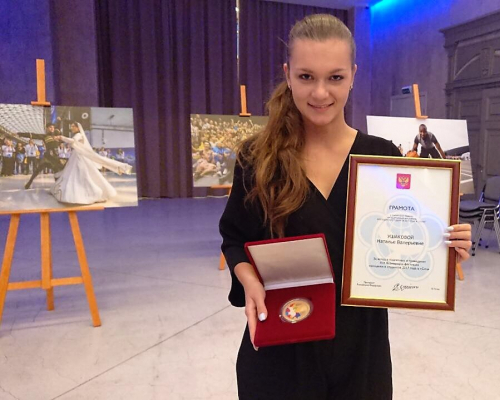 Natalia Ushakova, the director of the Volunteer and Social Activities Center of Tomsk Polytechnic University, was awarded with a memorial medal of the President of Russia for participation in the XIX World Festival of Youth and Students, held in Sochi 2017. The awarding took place in December 25 at the Moscow meeting of representatives of the festival organizing committee, the National Preparatory Committee of the Russian Federation, partner organizations, and regional preparatory committees. The medals were presented by Ksenia Razuvaeva, the head of the Festival Preparatory Committee. “It is perhaps the most important award of the outgoing year. It is hard to believe that all this is over, we were waiting for the festival so long. It is worth noting, that Vladimir Putin signed an order to establish the festival memorial medal in the beginning of December. This award was established "due to successful holding of the festival". On the front side of the medal there is the festival emblem and on the reverse side - the official logo and brand name of the XIX festival. In addition, the award was decorated with inscriptions “From the President of the Russian Federation” and the festival motto, "Together With the Whole Planet!" The World Festival of Youth and Students was held in Russia between October 14-22, 2017. On the first day, one held a carnival parade. The main events took place in the Sochi Olympic Park between October 15-22. About 25 thousand young people from more than 180 countries participated in the festival. It was representatives of public organizations, teachers, and politicians. Tomsk Polytechnic University was the only university with a center for selection and training of volunteers for this festival. Training of volunteers took place in the University’s International Cultural Center. The TPU volunteers were one of the best and even entered the top 500 best volunteers of the event. The Tomsk Region was represented by 50 volunteers, 23 of them from Tomsk Polytechnic University. The festival committee highly appreciated their work.